Roy Moore will probably win Alabama’s senate seat. Alabama is the toughest state for Democrats. There’s no reason to believe the Moore scandal will change that. Alabama Senate candidates Doug Jones and Roy Moore. Photo illustration by Slate. 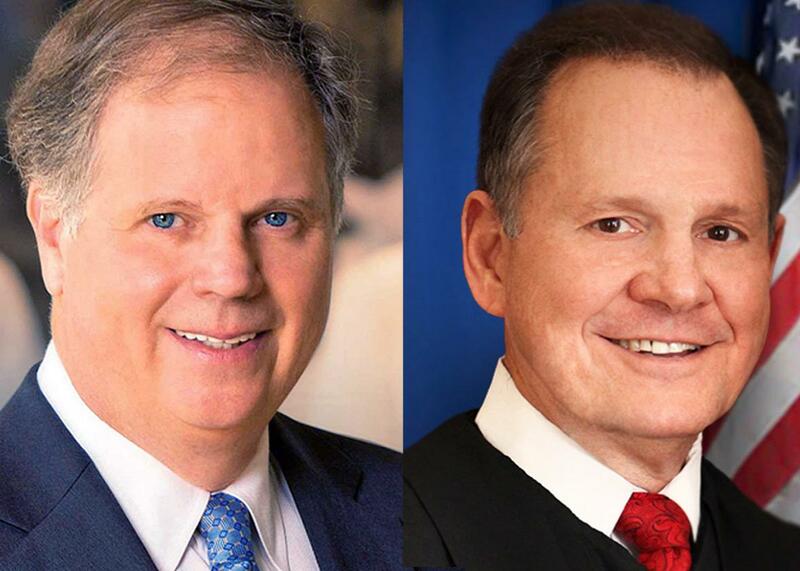 Photos by Doug Jones for Senate and Judge Roy Moore for Senate. On Thursday, the Washington Post reported that Roy Moore, the Republican nominee for Alabama’s open Senate seat, had propositioned several teenage women when he was in his 30s, including one 14-year-old girl who he allegedly molested. To discuss what the scandal means for the race between Moore and Democrat Doug Jones, I spoke by phone with Nate Cohn, a writer at the Upshot and the New York Times’ political data guru. The result of the Moore-Jones race to win Jeff Sessions’ former seat will be especially crucial, with Republicans trying to use their thin 52­–48 margin in the chamber to pass tax cuts and with Democrats desperate to go into 2018 needing to flip two seats instead of three. During the course of my conversation with Cohn—who is a friend and former colleague—we discussed why Alabama is going to be tough for a Democrat to win no matter how bad the Moore scandal gets, whether Democrats would be willing to overlook bad personal behavior to keep a Senate seat from falling to Republicans, and why in today’s polarized environment even someone like David Duke could get elected. This interview has been edited and condensed for clarity. Isaac Chotiner: Before we turn to Moore’s particular troubles, did anything about the Democratic performance in elections in Virginia and elsewhere on Tuesday make you rethink the Alabama race, which you, along with everyone else, pegged as a real long shot for Democrats? Nate Cohn: No. Most of the Democratic strength on Tuesday was in well-educated areas where Clinton excelled, and Alabama is not a state with very many well-educated areas where Clinton excelled. What about the minority turnout in Virginia and what it might portend? More than one-fourth of voters in Alabama are black, and Democrats are absolutely dependent on them turning out. Black turnout was higher than we expected, but it was by about as much as turnout was up statewide. So there’s not much reason to think that the black share of the electorate was greater than we anticipated, based on turnout by precinct. We entered the elections with fairly low expectations of black turnout in Virginia compared to a presidential election. And in Alabama, as you pointed out, that would be problematic for Democratic chances. I am going to ask you to speculate, but how much do you think this scandal might affect Moore’s chances to be elected next month? My honest answer is that I don’t know. Alabama is an extremely conservative state that is deeply polarized along racial lines. Hillary Clinton might not even have received 15 percent of the white vote in Alabama last year. For Doug Jones to win, he might need to double that number. So this is not an easy task at all for the Democrats. I am certainly open to the possibility that these allegations are enough to be a serious burden on Roy Moore’s chances, especially given that he has already shown some electoral weakness in Alabama in the past. But I don’t see any reason to assume he is in serious jeopardy either. There has been some talk of a Republican write-in candidate, such as Luther Strange, who lost the Republican primary to Moore. That would make it a three-candidate race. What impact do you think that might have? That’s also really tough to say. The thing I would want to point out, though, is that Alabama is a state where the Republicans would be favored even in a three-way race with two Republicans and a Democrat. Hillary Clinton received 34 percent of the vote in Alabama. The Democratic path to victory would require the Republicans to split the vote almost evenly. If a Republican had even a modest advantage among the two of them, that would be enough to swamp a 34 percent vote share. Now Doug Jones is a relatively strong Democratic candidate, and Democratic turnout has been good in recent elections. And the polls have shown Jones in the low 40s, which is considerably better than Hillary Clinton. To the extent that that 41 or 42 percent vote share that polls imply is a result of moderate Republican voters who can’t vote for Roy Moore, then I think he would probably lose a lot of that support to a more typical Republican like Luther Strange. If that’s a reflection of higher Democratic turnout and enthusiasm, which I think is at least possible to some extent, then maybe Doug Jones would keep more of that vote share in a three-way race. When I heard about this possibility, I immediately thought it would be great for Doug Jones, but it seems like you are saying it is conceivable that it could actually hurt Jones. If you believe that Doug Jones can win now—and I am open to that possibility—then I am not sure he gains very much by going to a three-way race. If you don’t think Doug Jones can win now, then the three-way race is worth it from a Democratic standpoint. What have you made of Doug Jones’ candidacy so far? I have two broad feelings on it. One is that I think he is a compelling speaker and his advertisements are effective. Some of the speeches I have seen on YouTube are very impressive. You live an exciting life. You have to scout all the candidates. The numbers aren’t everything, Isaac. But the second thing is that I am really surprised he isn’t running further to the center or even the right on a few issues. If you look at his campaign page, he is talking about Planned Parenthood. He doesn’t support a 20-week abortion ban. Alabama is an extraordinarily conservative state. I have never been to Alabama, but the numbers suggest that the political culture there bears no resemblance to what people from Northern blue states are accustomed to. White evangelical Christians represent a huge share of the electorate. They are deeply conservative, and I don’t know that you can win Alabama without making inroads among that group. And I don’t see Doug Jones making very much of an effort to assuage some of the concerns those voters are going to have about him. Is there any state in the country that is more likely to elect Roy Moore than Alabama? No. In Mississippi the white vote is more conservative, but black voters are a much larger share of the electorate. If you had a revolt against a Republican candidate and black turnout was high, I think you can imagine how the Democrats get over the top there in a way that is tougher to imagine in Alabama. The argument the other way is that Alabama has better-educated metropolitan areas like Birmingham or Huntsville where maybe you can imagine that a Republican revolt would be modestly more likely than it would in Mississippi. But no, I think Alabama is basically as tough as it gets for Democrats. There has been some debate about whether national Democrats should pour tons of money into the race, which has worried some Democrats who want to run a quieter Jones vs. Moore campaign, and not a big partisan Democrats vs. Republicans campaign. How involved do you think national Democrats should be? Should they try to keep it under the radar, which I guess is harder now! I don’t think you want it to be under the radar, but I do think that assistance from national Democratic Party committees would come with a real cost and make it even easier at the margins for Republicans to make the case that Doug Jones is going to be a tool of Nancy Pelosi or however they frame the argument in the closing part of the campaign. If I were Doug Jones, I would be doing everything I could to reassure people in Alabama that I am an Alabama Democrat and am not going to help the Pelosi-Schumer agenda, and I am going to work with Trump when I agree, and do everything I could to peel away a few more votes, because that’s what it will come down to if this race is close. In the 1991 race for governor in Louisiana, David Duke received almost 40 percent of the vote, which was a lot but not enough to win. We are living in a much more polarized time. Do you think that someone like David Duke, if he managed to win a Republican primary in a state like Alabama, could be elected to the Senate today? In 1988, George H.W. Bush won Louisiana by 10 points in an election he won by 8 points nationwide. So Louisiana was a state that at the national level was very competitive, and indeed Bill Clinton did extremely well there in 1992 and 1996. Democrats had a huge registration advantage. If you go back and look at the results by county in Louisiana, there are huge swaths where Dukakis won among white working-class voters, particularly in Catholic areas. So the scale of the David Duke underperformance in Louisiana was not necessarily as considerable as you might believe it is today given how far white voters in the South have moved towards the right. As I have said, Alabama is a very tough place for Democrats. It poses an extreme case, and I am very open to the idea that Republicans would prevail under any scenario, including the one you just described. And I think, by the way, that KKK membership is an issue that aligns with the issues Democrats care about most. But I do think in this political environment Democrats ought to at least give a moment of thought for what it would take for them to concede a Senate seat to Republicans. I think right now Democrats would tolerate a lot in order to prevent a seat from going to the Republicans. I don’t think they would tolerate someone who supported the KKK because that is so profoundly linked to Democratic political identity, but when it comes to personal conduct or other issues, I think it is hard to believe that California would vote for a Republican candidate under basically any realistic circumstances for a U.S. Senate seat.